Came across this graphic today. 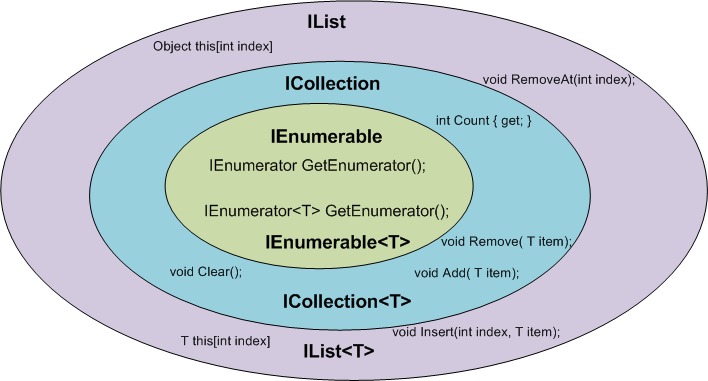 It shows the relationship between the collections interfaces in .NET. This article is for people who have defaulted on their Sallie Mae/Navient student loans. If you haven’t defaulted, or if you’re paying traditional subsidized or unsubsidized federal loans, this won’t work for you. For those of you that ARE in this position, this post is for you. You can get your life back. I’m sharing all of my actual numbers, because it makes the conversation more useful. Like many people, I was unemployed in 2009-2010. I had the bad fortune of graduating in the middle of the recession, and had quite a bit of difficulty finding a “big kid” job, i.e. one that would let me pay my bills–including my student loans. Also like many people who are struggling with debt they can’t pay, I was plagued by phone calls, and they were universally unproductive, because stones don’t have much blood to give. The first step to getting your feet under you is to create mental space, and the biggest thing is to stop the unwanted calls. This builds a strategic rolodex for tackling your debts when you’ve got your feet under you. If getting back on your feet takes a while–it took me 2 years–you’ll notice that debt gets resold fairly often, and as it gets resold, the settlement offers get better and better. This is particularly true for unsecured, consumer debt, and less true with student debt. Sallie Mae stops trying to collect debts themselves fairly quickly, and they tend to outsource this to other agencies. 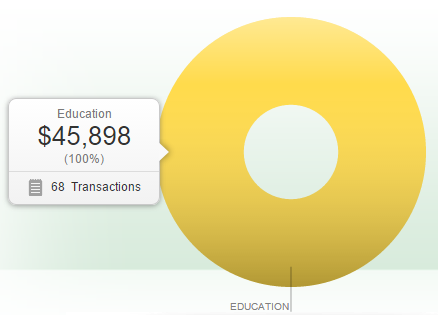 Unlike consumer debt, Sallie Mae does not sell the debt to the servicing organization. Instead they retain ownership of the debt, as well as the terms and conditions under which that debt may be settled. (In fact, if you try to call Sallie Mae directly, you will be redirected to the servicing agency without ever having talked to a human being.) The debt collector is just a proxy, but they’re the ones you’ll be dealing with. My debt was serviced by an organization called FMS. You can Google them; there are many horror stories, but my experience was pretty good, barring a few incidents. I had settled a couple of smaller credit card debts to this point, so I made sure to unblock their phone number only when I had a small lump of money available to make a down payment. I knew I wasn’t going to be able to discuss a full settlement, but maybe I could do something to move the needle in the right direction. This ended up being a good move, though the benefits weren’t obvious until much later. I’m going to use the term “default settlement” below. I don’t know for sure, but I believe that Sallie Mae’s proxies are authorized to offer some percentage (65-70% or so) as a settlement amount, without phoning the Sallie Mae mothership. The reason I believe this is true, is because they would periodically offer me settlements on the spot which didn’t require them to phone home. This was in contrast to my counteroffers which required a ~24-48 hour turnaround time where they had to talk to someone with more authority. I brought my account up to date on July 25, 2011 with a $1,493.38 payment, and set up a recurring payment every two weeks for $372.56. This was their “reduced interest plan”, where the interest rate dropped to 0.01%. There was no discussion of a settlement at this point that I can recall. If there had been, it would have been WAY more money than I had, so it didn’t matter. I made bi-weekly payments from July 2011 to May 2012. This dropped the loan term from 155 months to 45 months, a 9+ year reduction. BUT, if I broke the terms, the full balance came back at the original interest rate, minus whatever I’d paid. I went for it, because saving $80,000 and 9 years was too good to leave on the table. I set up a $400 recurring payment every 2 weeks, including months with 3 weeks to ensure I’d make the deadline with some headroom. Unfortunately, FMS wouldn’t send me paperwork stating the terms of the settlement, which (as I suspected) came back to bite me. I also hadn’t recorded our phone conversations, because until this point, there was no reason to think that I would need to. There was about a week of back-and-forth, but the takeaway was that I owed the $45.4K, but that the terms were extended until September 20, 2018. That was a big relief–there was no way my pre-wife and I could have come up with the money in that time. I made sure to record that conversation should things go awry again. Check the laws in your state… my state is a two-party state which means that I needed the rep’s permission to record the conversation. Because FMS can’t schedule more than 12 payments at a time, I end up talking to them about once a year. While re-upping my payments for this year, the rep mentioned that for whatever reason, Sallie Mae was accepting settlements “for pennies on the dollar this month”. That’s just a figure of speech, so I didn’t know if that was literally pennies or what, but she asked if I was interested in seeing if they would re-negotiate the settlement, because I’d basically paid $35K already, and was a model citizen. Of course I said yes, and they offered me their default settlement of $24K on the $35K owed on the spot, which is 68 cents on the dollar. I told them I couldn’t do more than $10K–a true statement–fully expecting a counteroffer for somewhere between $10-20K, whereupon we’d have to borrow some money from my wife’s parents. They said they’d have to call SLMA to see if they’d approve it. 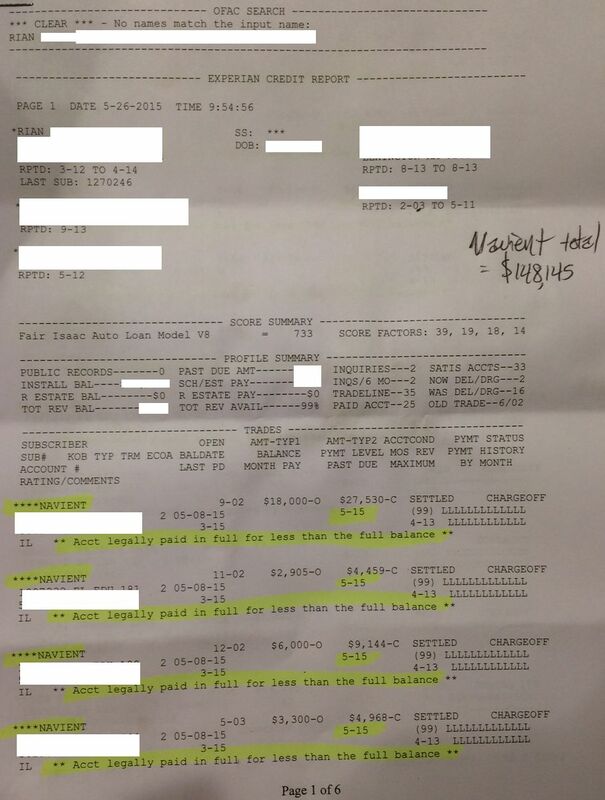 The next morning, I got a call back: Sallie Mae had approved the $10K for the remaining $35K. The rep was shocked. The manager was shocked. They told me no one in the office had thought it would go through, which I believe. I get the feeling I’m going to be an office legend for the foreseeable future. Here’s a Google spreadsheet that shows all the debits over that time. Alternatively, you can download the Excel version. I have more traditional subsidized and unsubsidized student loans that actually had interest rates, so I focused on overpaying those during this time. Other options include maxing our your pre-tax retirement contributions (401k/403b), and/or using your FSA plan to do something expensive like getting the LASIK you always wanted. Unfortunately, doing this latter thing requires knowledge ahead of time that you’ll be settling during this particular FSA year. Otherwise you’ll want to adjust your tax withholding, because you’ll pay an underpayment penalty in addition to the tax on this “income” if you don’t pay enough tax throughout the year. So I settled on a settlement saving my wife and I about $100,000 and ten years. This will let us buy a house and start a family years earlier than we had thought we’d be able to. I think my situation may be unusual, but I don’t believe for a moment that I am a beautiful and unique snowflake. 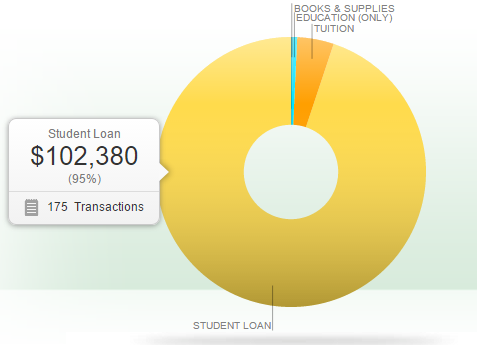 Three and a half years ago, my Sallie Mae situation seemed hopeless, and now… it’s over. It took a lot of hard work, and an unwavering focus to get here, but it can be done. If I can do it, so can others. Until today, I had no idea whether this was really done or not. I pull my credit report every year, and was expecting to wait until the summer in order to see if the status of my Sallie Mae/Navient loans were changed. But I bought a new car last week, and part of the financing involved the dealership pulling my credit report, which I was able to take a picture of. It indicated that the loans were settled for less than the balanced owed. I feel reasonably confident that this is the end. Finally. If it’s your first comment on my blog, it will probably go into the moderation queue. Don’t worry, it’s not lost; I just need to approve it. It could be a few minutes, hours, or days. I will get to it, though. Try to explain how your situation is different than people that have commented before you. Questions that amount to “I owe money, but can’t afford payments. What should I do?” aren’t constructive. I will assume all questions are about private loans only. Federal loans are a completely different kettle of fish. I received ten(!) 1099-C forms from Navient on Jan 28. When I reported them on my taxes, I collapsed them down into a single entry for the total amount. I also filled out insolvency Form 982. I was deeply insolvent at the time of the discharge, so instead of paying income tax on an extra $115,282, I only paid income tax on $32,313, because I was underwater by $82,969. $30K for $8K or 27 cents on the dollar – Jan 2016. 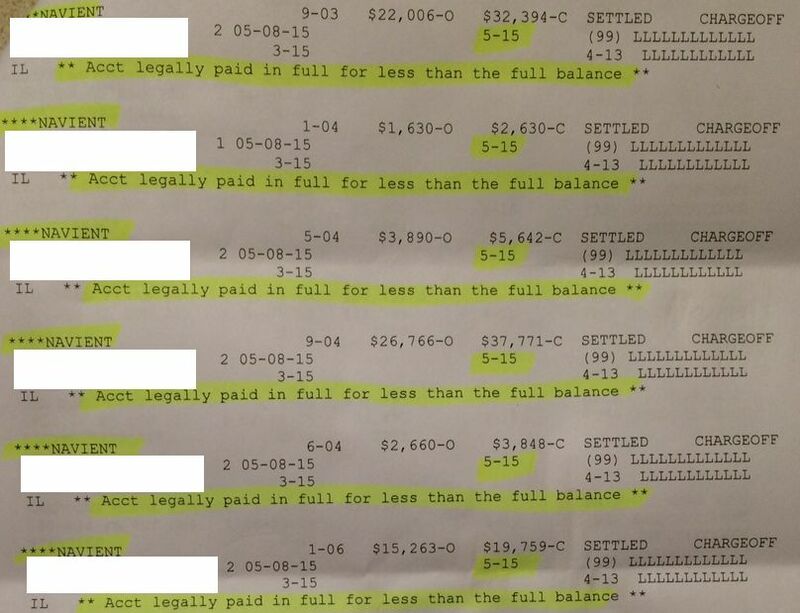 JK owed $107,000 and I asked them to settle for $8609 which was 10% of the unpaid balance before interest. It was accepted the next day and paid. I’ve come to really enjoy doing things deliberately: focusing on a handful of things I really care about and enjoy. Time is finite. Your attention is finite. Spend them both deliberately. It’s not obvious how to open a second instance of a program in Windows 8 and 8.1. Shift key to the rescue! Microsoft really should have made this clearer. I’ve updated my MediaWiki vendor branch to 1.23.4 for Mercurial users. tl;dr- It’s usually safe to substitute the phrase behaviors and guarantees into a sentence where you see the word “semantics”–and the discussion is about programming. Longer version: New programmers often come across the word semantics, and wonder what it means. Pretty much every explanation they will read points out the distinction between syntax (form) and semantics (meaning). This is easy to grasp, but not useful for understanding the word in the context of a sentence like: The stylistic choices should typically be driven by a desire to clearly communicate the semantics of the program fragment. Go ahead and substitute the word “meaning” there. It isn’t much help unless you’re already an experience developer. So to that end, new programmers… if ever you come across this word, it’s generally safe to substitute the phrase behaviors and guarantees in its place. This may help you understand the semantic intent (ha!) of the writer a little more.